Rosa M. Tumialán, a Member in the Firm's Chicago office, is a litigator who complements her practice with extensive judicial experience gained from clerkships in both the Illinois Appellate Court and the Chancery Division of the Circuit Court of Cook County. Ms. Tumialán is a member of the Firm’s Diversity Committee and Financial Review Committee. Ms. Tumialán focuses her practice on complex commercial disputes, including class action defense and insurance coverage litigation, in both state and federal courts. Ms. Tumialán's experience in representing clients in what is often a "bet the company" TCPA litigation has made her a lead defense attorney in this area as well as in litigation arising under other consumer privacy statutes such as the Illinois Biometric Privacy Act ("BIPA"). Ms. Tumialán is lauded for her ability to develop and employ unique and aggressive strategies for her clients in these evolving areas. Ms. Tumialán is routinely sought out by companies seeking TCPA and BIPA compliance analysis or those who face TCPA and BIPA liability. She also advises insurers on TCPA exposure and presently serves as national coordinating counsel for insurance clients who rely on her to develop and implement strategies nationwide, which includes daily monitoring of case law developments. She is often asked to opine on BIPA matters and represent clients named in BIPA class actions. Ms. Tumialán has also spoken on this statute which is becoming the latest darling of the plaintiff class action bar. 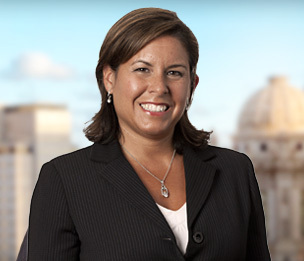 In addition to her TCPA and BIPA defense capabilities, Ms. Tumialán represents numerous insurers involving coverage disputes pertaining to personal and commercial lines, third party claims, surplus lines and bad faith exposure. Ms. Tumialán is also an appellate specialist and the coordinator of appeals in the Chicago office. She has defended and prosecuted numerous appeals in both state and federal courts involving insurance coverage disputes, complex commercial matters, constitutional questions, banking (federal and state regulations concerning consumer lending) and mortgage foreclosures challenges. Ms. Tumialán also authors and co-authors amicus briefs for national organizations such as the National Association of Mutual Insurance Companies, Michigan Insurance Coalition, Property Casualty Insurance Association of America and Insurance Institute of Michigan. Ms. Tumialán is a graduate of the Loyola University School of Law. She joined the firm in 2003, after completing a clerkship with the Honorable Robert Cahill of the Illinois Appellate Court for the First District. Her tenure with the state appellate court was preceded by a clerkship with the Honorable Thomas P. Durkin of the Chancery Division of the Circuit Court of Cook County. Recognized in Crain's Chicago Business special report "2018 Chicago’s Notable Minority Lawyers"